Chủ đề: SigmaKey Software update check here ! SigmaKey Software v1.18.03 is out! 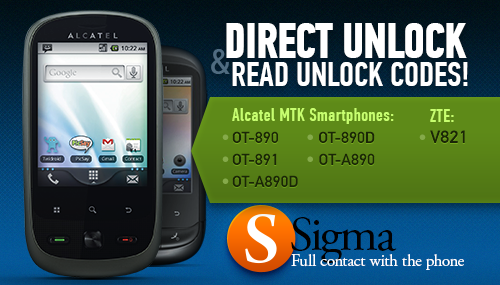 Fast Direct Unlock of ZTE mobile devices. This model also supports Heuristic Method of Unlocking. it has to be connected in turned on state. So, don’t forget to check the manual first. 2. Fastboot lock status detect for Huawei U8815, U8818, U8825D added. or use 3rd party tools. improvements for a wide range of phones and smartphones. Just set the smartphone to fastboot mode and proceed with unlocking. 2. Added * Direct Unlock / Repair IMEI for the following ZTE Android smartphones. Get acquainted with the unlocking manual before you start the procedure. 4. Improved Repair IMEI procedure for some specific firmware versions of ZTE phones. 5. Added 1 new firmware version for ZTE Blade Fast Direct Unlock / Repair IMEI. Pinouts are uploaded to the appropriate section of Sigma *******. 2. Added support for MTK MT6250 and MT6252 CPU-based cell phones. 1. A special present for our Belarusian partners. 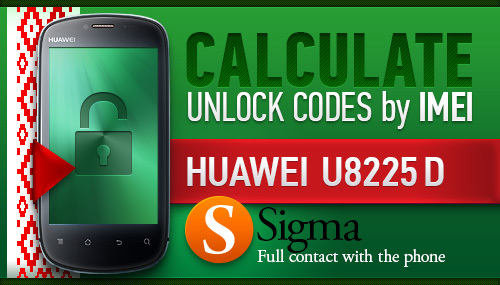 Unlock via Codes Calculation by IMEI. - Fast and safe method: type in phone's IMEI and press "Calculate Unlock Codes"
Perfect solution for big quantity of phones! This solution can also be used for remote unlocking. 3. 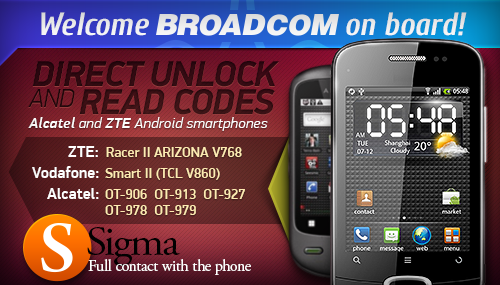 Added Direct Unlock and Read Unlock Codes for Motorola Milestone Plus XT609. Improved work with file system of MTK-based phones with NAND flash memory type. New build version of Sigmakey software available! We strictly recommend you to use the latest SigmaKey version! Detailed information on the latest Sigma Releases available here. SigmaKey Software v1.20.01 released! Broadcom, Welcome On Board! We continue our aggressive attack on the new unsupported phones and platforms. of the multiplatform solution has been again confirmed. detailed step-by-step manuals and drivers are located at the official *******. to unlock a smartphone even if it has an unknown firmware version. Introduced minor general improvements to the main software. that are based on MT6573 / MT6575 / MT6577 CPUs. Check out the thread. Sigma Software v1.20.02 is out! Sigma Software will read flash dump for unsupported firmware versions. Please send dump files to support to add these phones in the further updates. list of supported and there's more. so you are welcome to try running Get Codes operation and post your results. Detailed manual is here, so take a quick look at it before you start. ZTE F555 - First in the World! Want unlock support for more smartphones? Welcome to this thread! Sigma Software v1.20.04 released! ZTE T96 Added First in the World! And much more! versions supported for Fast Direct Unlock and a set of newly tested and supported mobile devices. Also, as a result of conducted analysis, a list of supported models was widely expanded. Fast Direct Unlock firmware versions. Unknown versions are supported via heuristic method. Sigma v1.21.02 - It's Not A Joke! for unlock firmware versions and there’s much more to it. for ZTE V807 / ZTE Blade C (MT6577) - in test mode. 2. Fixed Repair IMEI option for V889D. SigmaKey Software v1.23.00! 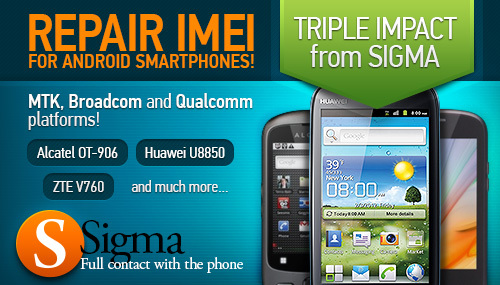 World Exclusive IMEI repair feature for Huawei mobiles! and Sigma Firmware v1.25 are out! just one compatible USB cable and you're all done. Save your time and money with Sigma! ❶ It's absolutely FREE for all Sigma owners. - you don't risk to kill the phone after flashing operation. so you will earn more in a shorter period of time. Your clients won't have to wait anymore! just connect a phone via USB cable and press Repair IMEI button. Detailed IMEI Repair manual along with all required drivers is located here. Sigma Software v1.24.01 is out! smartphones that are based on Broadcom, MTK and Qualcomm CPUs! While others make promises, we give solutions! 1. Added World's first Repair IMEI support for Huawei Vision U8850. that are based on MT6516 / MT6573 / MT6575 / MT6577 CPUs. with IMEI located in the file system (Software IMEI). You are welcome to test Repair feature and make feedbacks. and make a good investment into development of your business! Sigma Software v1.25.00 and Sigma Firmware 1.27 are out!Huawei U8833, U8951 and more! and Sigma Firmware 1.27 are out! The last bastion of Huawei smartphones has been conquered. New supported models, no more messing with locked bootloaders, faster IMEI repair and there's much more. Get more satisfied customers without additional expenses! after Repair IMEI operation and it's totally free! 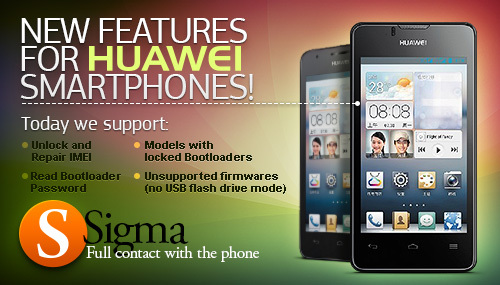 for Huawei smartphones with the locked bootloader. of the device before actual SP-unlocking! in Download Mode and perform Unlock / Repair IMEI procedure. IMEI will be repaired much faster in this mode. when connected to PC in Download Mode. for smartphones with locked bootloader. and wait days for password to arrive. No need to root your smartphone. With Sigma you'll get the password instantly and reset it easily. Re: SigmaKey Software update check here ! Sigma Software v1.25.05 is out! for a new series of hot and spicy ZTE smartphones. How to start: connect these models in download mode and you're all set. Detailed manual located in the Help section of the official *******. Want to keep your finger on the pulse of our latest developments? Subscribe on our YouTube channel today! It’s the right time to choose the right tool! 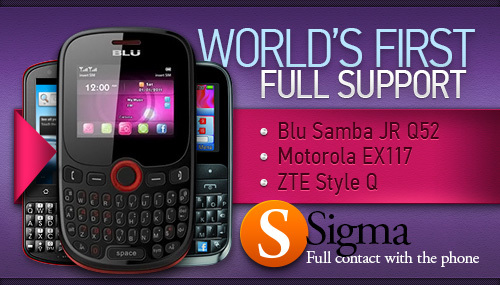 Sigma - full contact with the phone. SigmaKey Software v1.26.00 is out! Are you ready for the huge Qualcomm update? and Sigma Firmware 1.28 are out! a load of new features for more than 80 Huawei and Vodafone models! need to choose the model manually from the "Phone model" list. in the help section of Sigma *******. Please check it out before you proceed to operation. 2. Added Direct unlock support for Motorola EX300. Check the unlocking manual for it before start. 3. 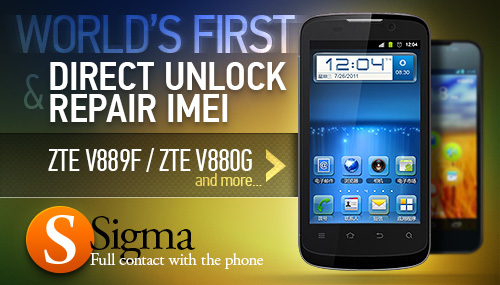 Added Direct Unlock / Repair IMEI support for ZTE Kis Pro. 3. Fixed issue with unlock of 2nd SIM on Alcatel OT-358D.